Inversion therapy treats chronic back pain by relieving gravitational pressure on spinal nerve roots and disks and increasing space between vertebrae by spinal traction, which many patients find helpful as part of a comprehensive treatment program for spinal disk compression. When the body weight suspends from an inverted position, the pull of gravity may decompress the joints. Such inversion is often effective in treating chronic back pain. Several types of inversion tables, classic, standard, basic, and mini, are on the market. One receiving consistently good reviews, ratings, and feedback from users is the Body Max IT6000. The table design is for inversion therapy exclusively. Applied with proper equipment and appropriate technique, inversion therapy counteracts the forces of gravity and reverses their negative effects on the body. Use of the Body Max IT6000 inversion table for just 10 minutes a day improves circulation and posture while relieving muscle aches, back pain, and traumatic stress. When the back muscles relax, so too does the rest of the body invariably. The IT6000 is easy to adjust with a deluxe dual-pin system that quickly finds the right position within a height range of four feet eight inches to six feet three inches. The user rests against the pad, locks the feet behind the ankle supports, and simply extends the arms over the head. As the arms rise, the body gradually inverts until almost entirely upside down. The only inputs are user energy and gravity. 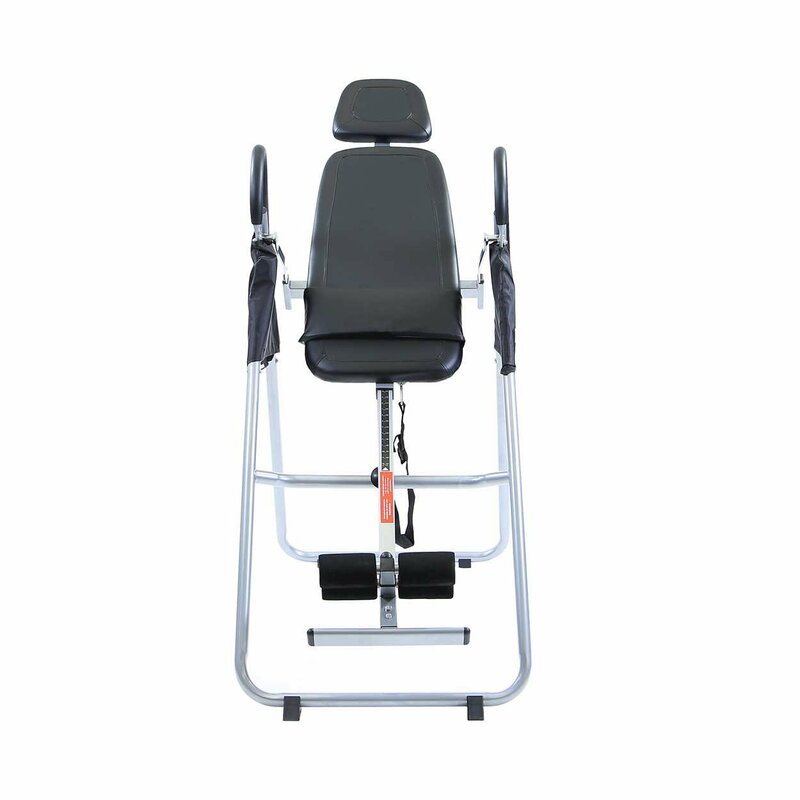 Prices on the inversion table market are typically from $300 to $400, so at $113.58 from Amazon the Body Max IT6000 is a great bargain for its sturdy construction, dependable performance, and curative results for users restored to life without debilitating back pain. Construction includes a lower spring-loaded pull pin for easy ankle adjustments, four comfortable foam rollers, U-shaped handrails, a safety strap for control of inversion angles, and a safety lock for when the table is not in use. Most users find assembly easy in about 20 to 30 minutes depending on their handyman skills. The product arrives complete with everything needed for assembly; most main bolts already finger-tight in their pre-drilled holes make assembly time quick. The design features a strong, durable steel tubular frame for sturdiness and steadiness. It can accommodate users up to 250 pounds in weight. A tough nylon fabric covers the tubular steel bed as a backrest. Four comfortable, high-density foam rollers secure the ankles, and a lower spring-loaded pull pin makes adjustment to the right ankle size easy. Users who feel discomfort in their ankles or feet when doing some inversions solve this problem with fitted foam tubing or additional pairs of socks. At 46 pounds, the Body Max IT6000 is light as inversion tables go and folds up for easy transport and storage. When not in use, it stores folded-up and safety-locked. The safety lock system eliminates any need to worry about falls during inversions. A safety strap controls inversion angles. When not in use, the safety lock keeps the table secure. The seller warrants the Body Max IT6000 frame for one year and associated parts for 90 days against defects and failures in use under normal conditions without prolonged extraordinary stress. The Body Max IT6000 is of precise design for treatment of the back and spine. As such, it needs proper care and maintenance to keep it completely secure. On delivery it is semi-assembled with major parts already in place and the rest for the user to attach. After final assembly, the user should make sure every bolt is tightly and securely in place with safety lock and strap functioning properly. A few users have complained about what they rate as cheap, low-grade assembly tools the seller provides, and it is probably true that all purchasers do better using their own tools. In one extreme case, delivery was on time but missing hardware for some assembly steps. A replacement package was also on time but missing the same hardware again. At that point, the customer turned to his own tools to complete the assembly. During inversion therapy, the heartbeat slows, blood pressure increases, and intraocular pressure increases dramatically after more than a few of minutes. For these reasons, anyone with high blood pressure, heart disease, or glaucoma never should try inversion therapy without prior consultation with a physician. The first-time user of inversion therapy should have a companion standing by for assistance in getting out of the inversion device or for help with a sudden health problem. People who suffer from chronic back pain or whose lifestyles make them susceptible to it should use this product. For some people in pain, physical therapy by inversion is more effective for relief than are medications. Instead of expensive medications and physical therapy sessions with technicians and masseurs with costs that quickly escalate, the IT6000, effective and easy to use, is a modest investment that becomes an even better bargain with use over years. Hi! I'm Tory Reiss. I built this blog to share my fitness quest and provide informative reviews of fitness equipment, gadgets, and supplements that you can use to help reach your health goals. Hope you enjoy it! Copyright © 2016 by Smart Monkey Fitness. All Rights Reserved.